Vehicle and Vehicular Equipment Maintenance specialists perform vehicle maintenance activities on military and commercial design general and special purpose, base maintenance, aircraft and equipment towing vehicles, and vehicular equipment. Activities include inspection, diagnostics, repair, and rebuild of components and assemblies. Related DoD Occupational Subgroup: 161000. Determines the overall mechanical condition of vehicles and equipment, correction of deficiencies required, and effects repair. Systematically analyzes malfunctions by visual and auditory examination or through the use of test equipment. Repairs, adjusts, overhauls, or replaces major assemblies or sub-assemblies such as power and drive trains, electrical, air conditioning, fuel, emission, brake, steering assemblies, tracks, hydraulic system components and special purpose vehicle and equipment attachments. Removes disassembles and repairs gasoline or diesel engines and components. Repairs components by replacing worn or damaged parts with new or reconditioned parts, grinding, fitting, balancing, or arranging for welding or machining. Reassembles, adjusts and tests repaired units for proper operation. Aligns bearing loads, gear tooth contact, and backlash to manufactures specifications. Adjusts valve mechanisms, governors, oil systems, control linkages, clutches, traction units and other systems unique to this type of equipment. Times injection pumps and accessory shaft gear trains. Performs preventive and special maintenance. Uses technical publications in maintaining vehicles to prescribed manufactures maintenance schedules. Ensures special inspections and maintenance on vehicles are performed correctly such as; corrosion control, winterization, storage and shipment. Properly annotates all maintenance performed on prescribed forms for data collection. Adheres to all established safety policies and standards to include identification, use, and proper procedures for handling or disposal of hazardous wastes. Plans and schedules vehicle, equipment, and allied trades maintenance activities. Plans and controls work methods, production schedules, operating procedures, and performance standards. Monitors established maintenance priorities; tire and battery shop operations and determines mission requirements. 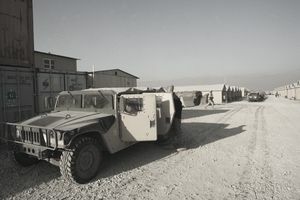 Ensures vehicles, equipment, tools, parts, and manpower are available to support mission requirements. Inspects and evaluates vehicles, equipment, and allied trades functions. Diagnoses malfunctions of major assemblies and subassemblies to determine the extent of repair or replacement, or recommend disposition of vehicles and equipment. Inspects repaired or rebuilt parts and equipment to ensure work conforms to standards. Inspects equipment for required modification and installation of safety devices. Ensures shop equipment is inspected and serviced at required intervals and that unserviceable tools and equipment are removed from service, and their condition tagged. Identifies and initiates material deficiency reports at work center level. Performs vehicle, equipment, and allied trades maintenance functions. Solves complex maintenance problems by interpreting layout drawings, specifications, schematics, diagrams, and operating characteristics of vehicles and components. Uses technical orders, commercial manuals or automated systems to determine maintenance procedures and research parts. Troubleshoots, adjusts, repairs, and tests vehicles; alternate fuel, diesel, and gasoline engines; fuel, exhaust, and electrical systems; clutches; torque converters; transmissions; transfer cases; power takeoffs; drive lines; axles; frames; steering, suspension, dispensing, brake, air, and hydraulic systems; tracks; winches; emission control, heating, and air-conditioning systems, active/passive restraint systems and other mounted or special equipment. Repairs, replaces, and aligns damaged body sections, upholstery, and accessories. Prepares and finishes painted surfaces. Cuts, grinds, repairs, and installs vehicle glass and Plexiglas. Welds vehicle parts and accessories, and operates industrial sewing machines. Practices and ensures compliance with all established safety policies and standards. Implements hazardous waste management policies and procedures ensuring collection, control, and disposition of hazardous and toxic waste material accumulations. Knowledge is mandatory of electrical, mechanical, and hydraulic principles applying to the repair of special purpose vehicles and equipment; methods of hoisting and handling heavy mechanisms; using lubricants, tools, and publications; supply procedures; and internal combustion engines. For 2T7X1 (The "7" Skill Level), knowledge is mandatory of principles of vehicle maintenance; Air Force Occupational Safety and Health Standards; training programs and procedures; simple mathematical computations; alternate fuel, diesel, and gasoline engines; fuel; suspension; steering; air and hydraulic brake systems; automatic and standard transmissions; driving axles and power trains; electrical wiring systems; pump and dispensing systems; equipment used with special purpose vehicles; use of oxyacetylene and electrical welding equipment; metalworking methods; mixing and applying primers; paints; fillers and solvents; handling and storing paint and epoxy; using stencils; spray guns; respirators; buffing and sanding equipment and industrial sewing machines; bodywork; battle damage repair; supply discipline; and procedures for obtaining parts, supplies, and equipment. For entry into this specialty, completion of high school with courses in automotive mechanic or industrial arts is desirable. For award of AFSC 2T331: completion of a basic special purpose vehicle and equipment mechanic course is desirable. For award of AFSC 2T370: completion of the vehicle maintenance craftsman course is mandatory. For award of AFSC 2T351: qualification in and possession of AFSC 2T331 is mandatory. Also, experience is mandatory in functions such as inspecting, repairing, or maintaining special purpose vehicles. For award of AFSC 2T370: qualification in and possession of AFSC 2T351/52A/52B/52C or 2T355 is mandatory. Also, experience supervising functions such as inspecting, repairing, modifying, or troubleshooting vehicular and equipment systems, automotive body repair and refinishing, fabrication, mixing and applying paints, upholstery, operating industrial sewing machines, or welding. Medical Requirements: For entry into this specialty, normal color vision according to AFI 48-123, Medical Examination and Standards, is mandatory. Required Appitude Score: M-44 (Changed to M-47, effective 1 Jul 04).